Moldovan President Vladimir Voronin (RFE/RL) CHISINAU, November 6, 2007 (RFE/RL) -- Moldovan President Vladimir Voronin says a solution may be in sight to the 15-year-old "frozen conflict" with the Moscow-backed breakaway region of Transdniester, with international talks producing a draft plan to grant separatists large autonomy and achieve reunification. In a wide-ranging, exclusive interview with RFE/RL in Chisinau, Voronin also rebuked critics who say Moldova is being politically opportunistic by courting both Russia and the European Union, depending on its momentary interests. And he lashed out at neighboring Romania, with which Moldova shares a linguistic heritage, for what he called "questioning the Moldovan state's national identity." But it was on Transdniester that Voronin, a former Soviet general who now leads Moldova's Communist Party, expressed optimism that a solution may be nearing. Transdniester, a wedge of territory in Moldova's east with a population of around half a million, is widely viewed as a source of regional instability and the smuggling of arms, drugs, and people. "A draft of the future status of Transdniester's autonomy has already been agreed upon," Voronin stated in the interview, conducted on November 2 at the presidential palace in the Moldovan capital. "A mechanism of guarantees for implementing this status and work toward reunification has also been agreed on." The draft is the brainchild of what Voronin called intensive bilateral consultations that have taken place with all members except Transdniester of the so-called "5+2 format," which has shaped international efforts to settle the dispute over the past two years. The format also includes the Organization for Security and Cooperation in Europe (OSCE), Russia, Ukraine, the United States, and the European Union. However, only two 5+2 meetings involving face-to-face talks between Moldova and Transdniester have taken place. Moldova abandoned the last meeting in February 2006, citing a lack of progress. But in their place, Voronin says, came a series of talks between Moldova and the grouping's other members. "I highly appreciate the bilateral consultations which have already taken place between Moldova and the Russian Federation, the United States, the European Union, Ukraine, the OSCE," Voronin said. "I also have a high regard for the ongoing consultations on the Transdniester dispute between the United States and the Russian Federation, and between Ukraine and the European Union." Voronin would not elaborate on the plan's details. He said that while all the mediators -- most notably Russia -- had agreed on it, Transdniester itself had yet to be brought on board. Previous plans, in 1997 and 2003, failed after Transdniester's Moscow-backed government made clear it wanted a union of two virtually independent states, with separate parliaments, armies, and police forces. 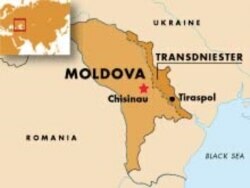 Moldova was prepared to give Transdniester wide-ranging autonomy, but not independence. Wary that a pro-independence outcome in the current negotiations on the future status of Kosovo might give a boost to Transdniester's own push toward sovereignty, Voronin cautioned against using Kosovo as an example for solving other separatist disputes. "I don't think that a solution in any frozen conflict should be set as an example for others, because each conflict -- the Transdniester one, if you want, or Kosovo -- has its own roots, its own history, and its own evolution, as well as its own solution, which can apply only to that conflict," Voronin said. "There can't be just one solution for all conflicts." But concerning Romania, Moldova's only EU neighbor, Voronin wasn't as optimistic. He said a decision this year by Bucharest to ease citizenship requirements for Moldovans has damaged relations. "If the Romanian authorities continue to base relations with us on questioning the Moldovan state's national identity, I am not convinced that [relations] will improve," he said, adding that Chisinau will "complain to all European and international bodies, because this concerns Moldova's statehood." In regards to Russia, Voronin spoke more favorably. He praised Moscow's decisions to lift a ban on Moldovan wine imports and to sign a five-year gas delivery agreement. "Geographically and politically, Moldova spans East and West," he said, adding that Moldova enjoys benefits both from being a member of the Commonwealth of Independent States and as a state bordering the EU. "This doesn't mean that we are shifting from one side to the other. We are pursuing our national interests." FROZEN CONFLICT: On January 11, 2006, RFE/RL's Washington office hosted a panel discussion on prospects for settling the Transdniester conflict. The roundtable featured STEFAN GLIGOR and STELA JANTUAN of the Information, Analysis, and Prognosis Service of the Moldovan parliament and ALEXANDRU FLENCHA, head of the information and analysis division of Moldova's Ministry of Reintegration. An archive of RFE/RL's coverage of Transdniester.